The leaves and rhizomes of bogbean have been used in medicine for stomach complaints. 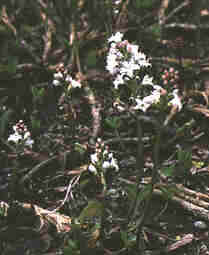 Bogbean, Menyanthes trifoliata, is commonly found in Sweden in marshy areas. It has had a high incidence of use as a medicinal plant for many hundreds of years, principally because of its bitter taste. 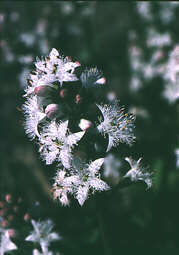 Even in our times the bogbean is used in traditional medicine to treat, among other things, inflammation of the kidneys. In Linnaeus’ book Materia medica (1749), he recommends it for inflammation of the kidneys, rheumatism as well as for stomach complaints. Linnaeus’ disciple and successor as professor of medicine in Uppsala, Carl Peter Thunberg, wrote a thesis about the use of bogbean which was published in 1797. Many bitter tasting plants have been used for increasing the secretions in the stomach and thus improving the appetite which affects condition in general. Scientific studies have shown that bogbean contains several different bitter tasting substances which affect the stomach and intestinal system. Loganin is the bitter tasting substance which occurs in the greatest quantities in the plant. Apart from bogbean, absinth, yarrow and yellow gentian have also been used. Earlier, plants were graded for quality according to their bitterness. Stidies in systematic botany have shown that bogbean is closely related to yellow gentian (Gentiana lutea). Pharmacological and chemical studies of the bogbean have been carried out at the Department of Medicinal Chemistry, Division of Pharmacognosy of Uppsala University. A decoction of the plant has been shown to reduce inflammation and to have a protective effect against kidney damage. Here too, the bitter substances are at least partly responsible for the medicinal effects. However, more scientific studies are needed before it can be recommended to patients.